Got work worries? Tarot helps you with work challenges, whatever they may be: completing projects on time, managing your relationships with clients and co-workers, and even asking for a raise. Your cards help you to expand your everyday mind, so that you can access your subconscious at will, and so that you’re more open to promptings from your intuition. Here’s an example of how it works. I’ve started work on a book proposal. The topic is one I know well, and I have a mass of notes and research that I need to compile into a 10,000 word proposal within two weeks. Since this is the start of this project, I want to know how the project will develop. I shuffle my deck face down (in this case the Hanson-Roberts Tarot Deck), while thinking meditatively about the project. Card 3: (right base of the pyramid): challenges. Card 3: Knight of Swords. In brief: the project looks like a goer. I’ll need to remember that the project needs to be balanced to consider both sides of my topic, and that I should pursue my work on it aggressively. 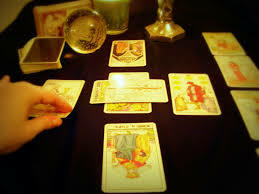 What’s the difference between a guidance reading and fortune telling? I’m often asked this question, or variations of it. The answer is that no matter what you choose to call it, guidance or fortune telling, the power to act remains with you. It can’t be any other way. The cards, as such, are only cardboard, after all, but they reflect your current consciousness, and often with astounding clarity. The reason cardboard cards reflect your consciousness is because these archetypal images are actual energies inherent in human consciousness. Materialist psychology says that archetypal energies are part of consciousness; the spiritual view is that the energies are creation energies. 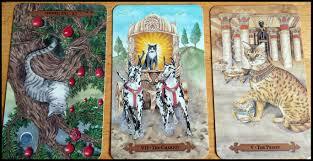 The cards show you what you know at some level, and bring the information to conscious awareness. You can then act on that information. For example, the Knight of Swords in the above spread shows me what I know: that I have a tendency to start projects with good intentions, and then get sidetracked. The Knight reminds that I need to work on this project every day, so that I can complete it by the deadline. I have deadline for my project’s completion: two weeks from now. I’ll record this initial spread in my journal. As I work on the project, I’ll draw other cards for creative advice. Can I use other spreads? The best spreads are ones you create yourself for your current need. Big spreads take a long time to interpret, however. If you do a Celtic Cross for example (ten cards), a complete interpretation will take at least an hour. The above three card layout will probably be the longest spread I do for this project. 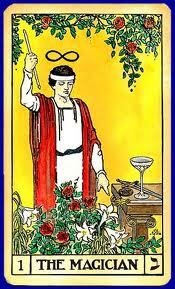 If I’m befuddled about something, I’ll pull a single card. If I need to make a choice between two or more options, I’ll pull a card for each option.